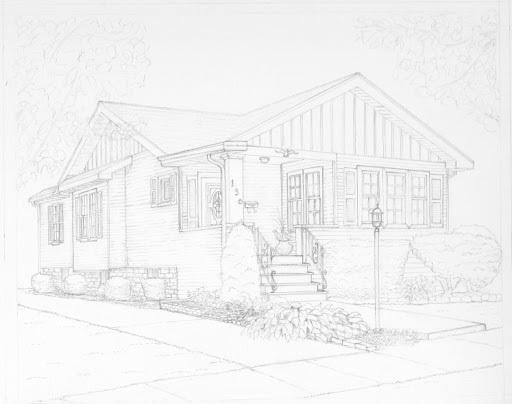 I think I have finalized the pencil draft of this house portrait. I added the landscaping in the front and actually had to tweak the perspective a bit as the line from the back of the house to the front flower bed was a bit off as I worked. I also finished penciling in the siding – it looks a little rough here, but when I do the final inking I will be using a straightedge for some of it to make sure it stays on track. I did some additional adjustments with the front steps, sidewalk, and also added some foliage to the side beds, working closely with the client. I should be ready to start inking now. Stay tuned for the final artwork!